For twenty years since the publication of his seminal paper 'The Market for "Lemons"', George A. Akerlof's work has changed the way we see economics, and the economics of information in particular. In abandoning the perfect-competition benchmarks of classical economics, the pragmatic modern economics championed by Akerlof has provided deep insights into markets, identity, discrimination, motivation, and work, and into behavioural economics in general. This collection of Akerlof's most important papers provide both an introduction to Akerlof's work and a grounding in modern economics. Divided into two broad areas, micro- and macroeconomics, they cover the economics of information; the theory of unemployment; macroeconomic equilibria; the demand for money; psychology and economics; and the nature of discrimination and other social issues. The collection closes with Akerlof's 2001 Nobel Lecture, in which he argues that it is imperative that macroeconomics be considered inherently behavioural. Akerlof's substantial introduction to this volume tells the story of these papers, connecting them and showing how his later work has built upon his early contributions, in many cases improving their arguments, their subtlety, and their usefulness today. George A. Akerlof is Koshland Professor of Economics at the University of California, Berkeley, and the 2001 Nobel Laureate in Economics. 10. 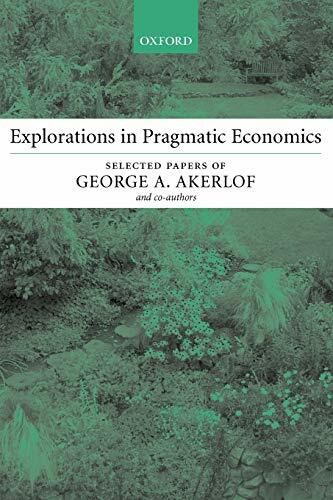 Explorations in Pragmatic Economics [Paperback] Akerlof, George A.